Zak’s in Ballard is all about the burger. It’s a burger joint after all so don’t come looking for much else. The menu is simple and straight forward with 1/3lb beef patties instead of the seemingly industry standard of 1/4lb. They have a choice selection of “ice cream drinks”, think shakes and malts, and they have a nice little round up of a few brews for the thirsty and riotous. To continue with the theme of simplicity I went with the straight forward bacon cheese burger instead of the Big Johnson (double meat, double cheese, double bacon). Outside of the bacon and cheese (Tillimook cheddar) the standard support cast at Zak’s includes mayo, mustard, ketchup, pickle, onion, and iceberg lettuce. The burger arrived and it was immediately obvious that the cheese was not fully melted, hell it wasn’t hardly partially melted. It was more like sweated. But to be fair there was enough going on with the burger in other areas to bring it back from the depths of ridicule. The bun was a beautifully chewy kaiser roll with gorgeous mouthfeel. The bacon was divine. Excellent, thick cut, with a heavy yet delightful pork flavor. So thick it was like a slice of bacon ham. Legit pig. The veggies were nice, especially the iceberg lettuce, but they seemed marred by stock ketchup and mustard. I don’t feel ketchup ever belongs on my burger, at least serve it on the side for those that prefer it, and although I love a good mustard that generic yellow jobber posing as mustard will simply never suffice. The beef was ok. It had some nice beef flavor but didn’t live up to the “100% fresh ground chuck” claim. The texture and flavor just didn’t seem fresh to me but to be fair it was a far cry from bad. Amid all my misgivings, Zak’s is exactly what it claims to be. A burger joint. 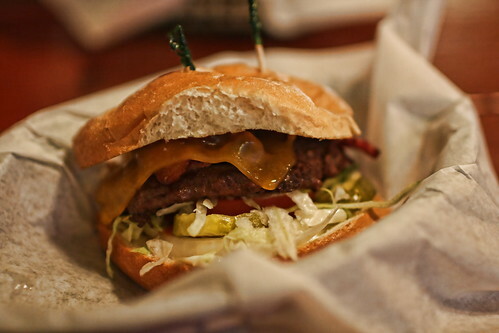 I spend way too much time on your blog, but I enjoy a good burger and like what you do here! The cheese in that picture looks melty to me. Not cooked down, but it isn’t refrigerator or even room temp. Translucent and sweaty, it would have the full flavor you couldn’t get from cold cheese. Then again, it could have melted after it got to your table. What do restaurant owners think when you are snapping pictures of their food? That’s fair. I like a fully melted slice and for me and my palate that was under melted, but point taken. I have never had an issue photographing anything in 10 years of photography minus a military area in Cambodia and a cupcake shop in California. Thus far all the burger stops have been cool.